I'm always interested in seeing what got people started. I wonder what their first find was that sparked a thrifting or antiquing obsession passion. I wonder if it developed quickly as a compassion to continue or was a slow progression over time. I wonder if they saw it spawning to this magnitude from the very beginning. 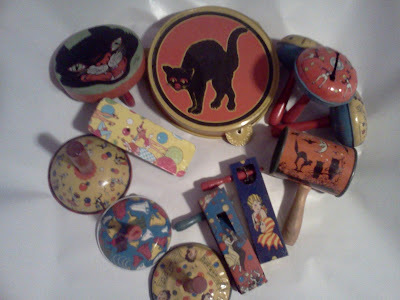 For me, it all began with Halloween noisemakers. I found them at a yard sale over two years ago; a group of three were sitting together amongst the other items on the table. Always a conservative spender, my step-mother was shocked into oblivion when I coughed up the $15 for the set. I wasn't sure why I felt so compelled to take a chance on them that day, all I knew was that I had never seen anything like them before. When I got home, I started researching. I looked up the companies, the designs, the time period they were made in...I looked up everything I could think too. When I finally turned my sights to eBay to determine whether I had flushed my $15 down the toilet, I was shocked and pleased at what I found. Bottom line, they were definitely worth it and definitely not overly common. From there it just kind of spiraled. Soon I was looking for noisemakers, Halloween memorabilia, post cards, old books, vintage kitchen items, cookbooks, and more. Pyrex eventually topped the list starting with a medium woodland refrigerator dish. Now it's something of an addiction.